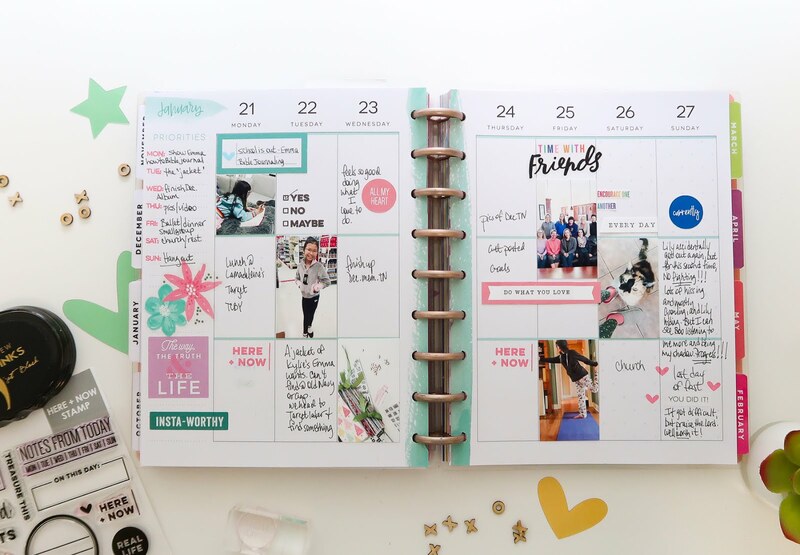 I have always loved planners, and relied on one heavily when I had an office job...Franklin Covey, couldn't do a thing without it. As my life has changed and continues to change, I still love and rely on having some kind of structure to plan, but I seem to always go back to something creative, meaningful, and memory related. 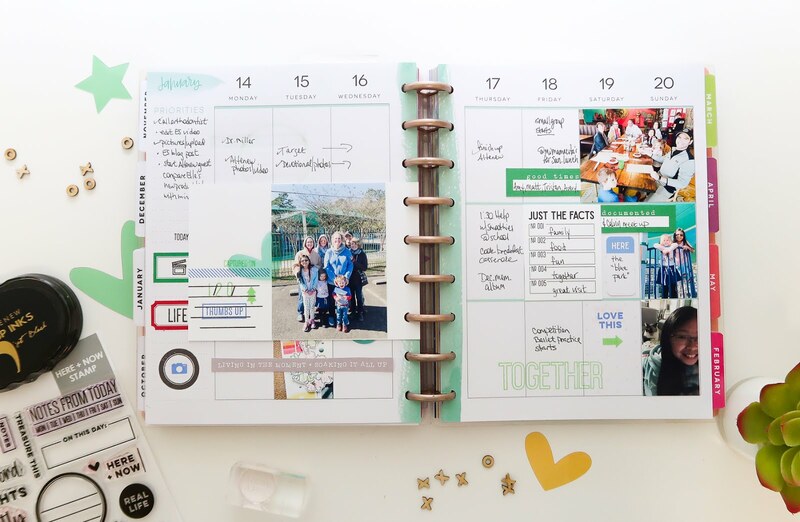 So I have been tinkering with the Happy Planner I purchased last Fall to incorporate their pockets and to start including photos during the week as well. 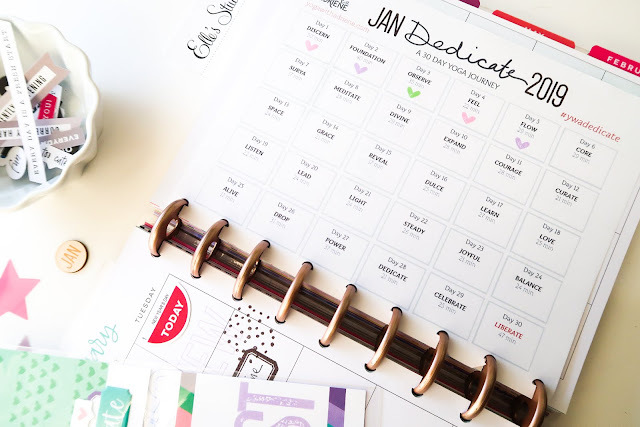 Here's how January has come out. The Elle's Studio products really helped me to keep the start of the year fresh and encouraging. I used the Happy Planner punch to punch my printout of the Yoga with Adriene for the January 30-day challenge and used the heart stamp from the Here + Now stamp set in the colors of my spread to mark off each day. 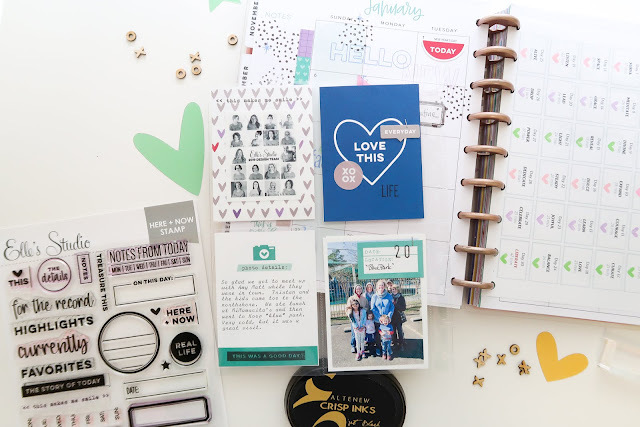 Then I used a variety of other stamps and some of the die cuts from the January Kit to my pages. I really need it to be functional, but I really love to be able to add motivation and highlight days using the products. 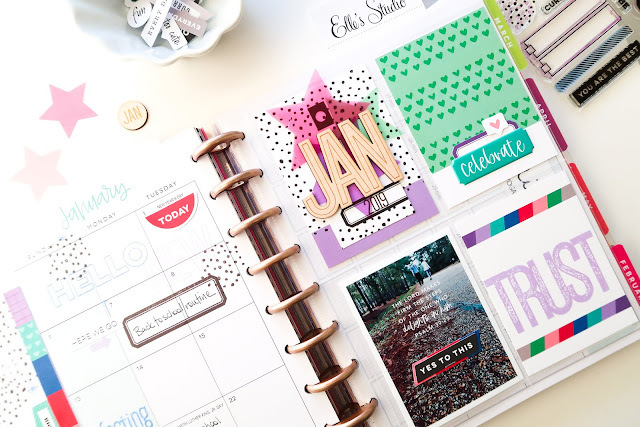 Elle's Studio products are a perfect match to planners. Then this past week, I finished up the reverse side of that pocket and started adding photos to the weekly views. New planner format for me, and since I have decided to go back and document in both 6x8 pocket pages and Travelers Notebook format, I think this is a great way for me to get the details of our lives down, and then be able to pick stories to highlight in those other formats. 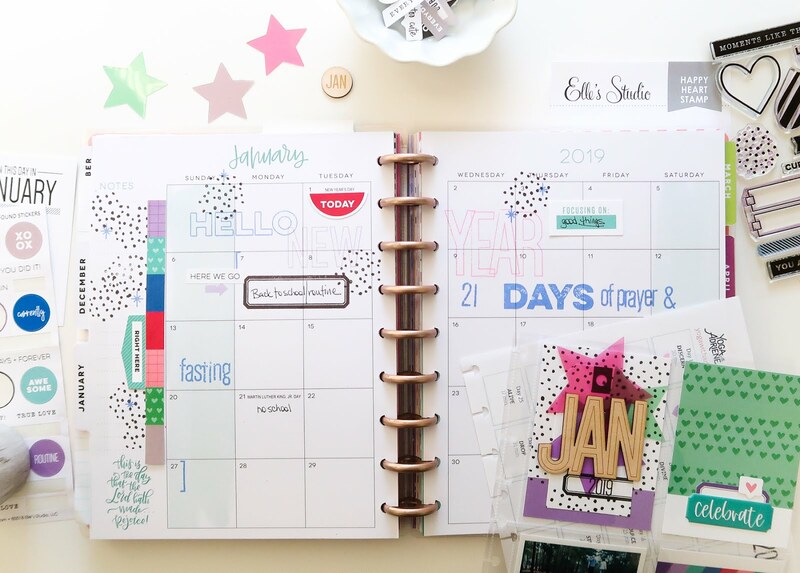 I think one thing that draws me to this planner are the rings and the punch...I can so easily just punch the Elle's Studio tags, a printout, a photo, etc. and slip it into the rings. On the reverse side of that tag, I added more stamping and a photo. Did some overlapping with that photo on the far right, and I do love that look. 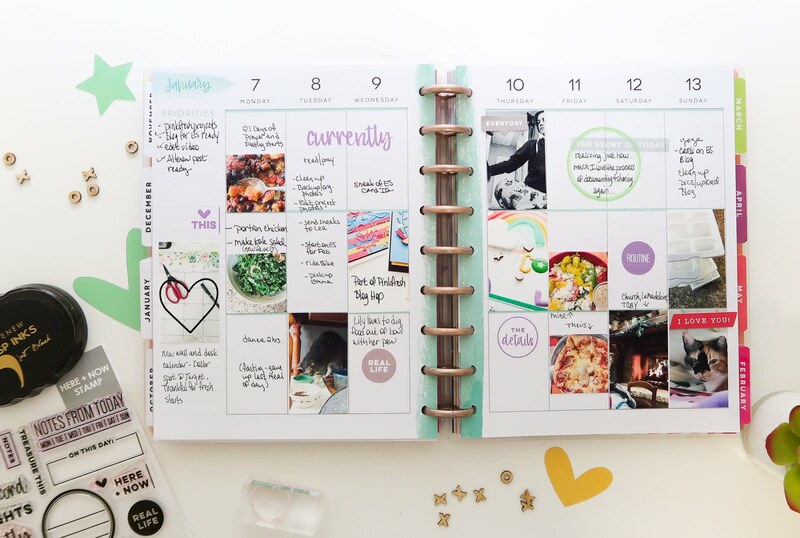 I mixed in just a tiny bit of the Happy Planner stickers, but for the most part I used the Elle's Studio products. I've done a Heidi Swapp memory planner a couple of years ago, and pulled that out to look through. 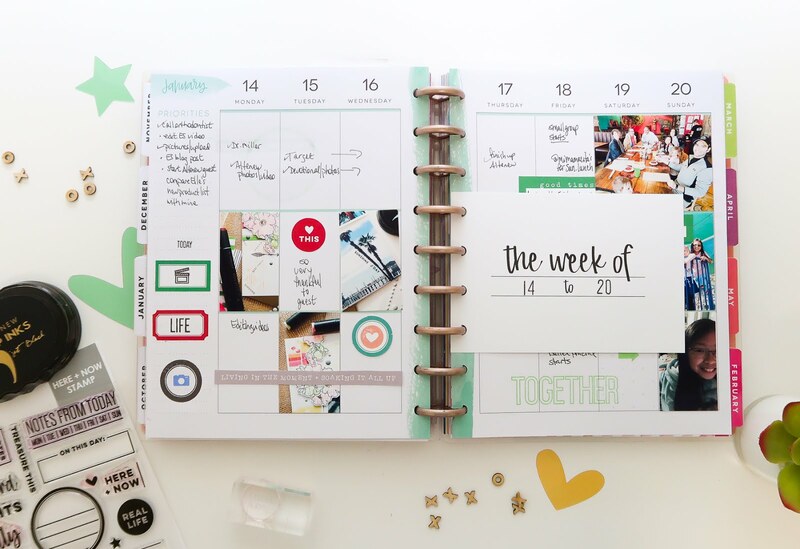 It really is a great way to combine planning, events, details, and the good and the bad stuff of life in one place, so I think this is how I will document the real-time life. Keeping it simple, practical and functional. 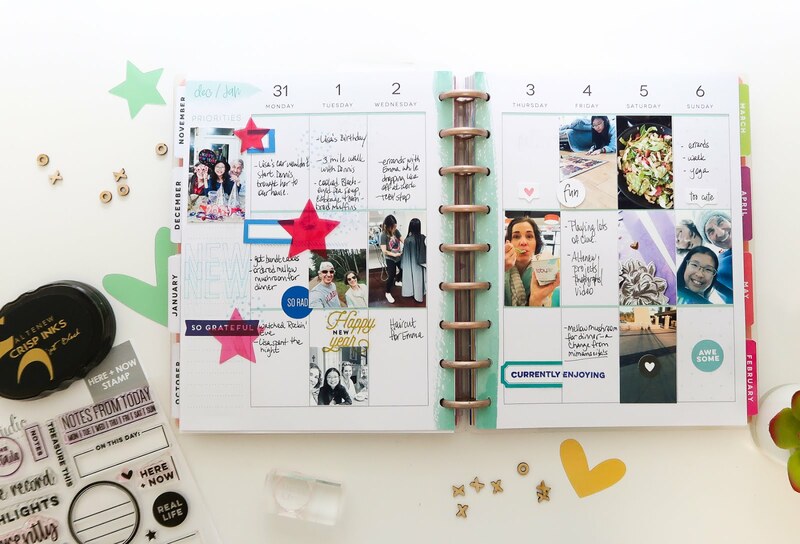 Thanks so much for stopping by, would love to hear if you also do a Memory Planner! Thank you for taking time out to leave me a comment...hope you have a wonderful day!